The first is Europe’s Angry Muslims: The Revolt of the Second Generation (OUP 2011) by Robert S. Leiken (Brookings Institution). The publisher’s description follows. Bombings in London, riots in Paris, terrorists in Germany, fury over mosques, veils and cartoons–such headlines underscore the tensions between Muslims and their European hosts. Did too much immigration, or too little integration, produce Muslim second-generation anger? Is that rage imported or spawned inside Europe itself? What do the conflicts between Muslims and their European hosts portend for an America encountering its own angry Muslims? 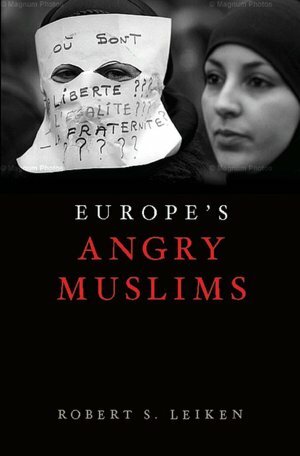 Europe’s Angry Muslims traces the routes, expectations and destinies of immigrant parents and the plight of their children, transporting both the general reader and specialist from immigrants’ ancestral villages to their strange new-fangled enclaves in Europe. It guides readers through Islamic nomenclature, chronicles the motive force of the Islamist narrative, offers them lively portraits of jihadists (a convict, a convert, and a community organizer) takes them inside radical mosques and into the minds of suicide bombers. The author interviews former radicals and security agents, examines court records and the sermons of radical imams and draws on a lifetime of personal experience with militant movements to present an account of the explosive fusion of Muslim immigration, Islamist grievance and second-generation alienation. 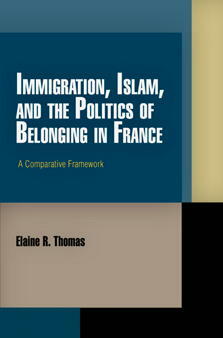 The second book is Immigration, Islam, and the Politics of Belonging in France: A Comparative Framework (U. Pennsylvania Press 2011) by Elaine R. Thomas (Bard College). The publisher’s description follows. Over the past three decades, neither France’s treatment of Muslims nor changes in French, British, and German immigration laws have confirmed multiculturalist hopes or postnationalist expectations. Yet analyses positing unified national models also fall short in explaining contemporary issues of national and cultural identity. Immigration, Islam, and the Politics of Belonging in France: A Comparative Framework presents a more productive, multifaceted view of citizenship and nationality. Political scientist Elaine R. Thomas casts new light on recent conflicts over citizenship and national identity in France, as well as such contentious policies as laws restricting Muslim head-scarves. Drawing on key methods and insights of ordinary language philosophers from Austin to Wittgenstein, Thomas looks at parliamentary debates, print journalism, radio and television transcripts, official government reports, legislation, and other primary sources related to the rights and status of immigrants and their descendants. Her analysis of French discourse shows how political strategies and varied ideas of membership have intertwined in France since the late 1970s. Thomas tracks the crystallization of a restrictive but apparently consensual interpretation of French republicanism, arguing that its ideals are increasingly strained, even as they remain politically powerful. Thomas also examines issues of Islam, immigration, and culture in other settings, including Britain and Germany. Immigration, Islam, and the Politics of Belonging in France gives scholarly researchers, political observers, and human rights advocates tools for better characterizing and comparing the theoretical stakes of immigration and integration and advances our understanding of an increasingly significant aspect of ethnic and religious politics in France, Europe, and beyond.